Living in Iowa one thing is for certain at one point or another it is going to rain. Rainwater can cause damage and wear and tear on your home, especially if it is not collected and diverted away from your property. 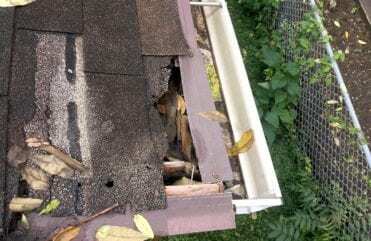 At least two times a year, once in the spring and once in the fall, we suggest a gutter check. Below are a few safety tips, tool, and maintenance suggestions to think about before cleaning your gutters. Let someone know that you will be working on a ladder. Inspect the ladder. Check for defects and make sure screws and bolts are tightly fastened. The extension-hinge arms should be entirely extended and locked into place before climbing. 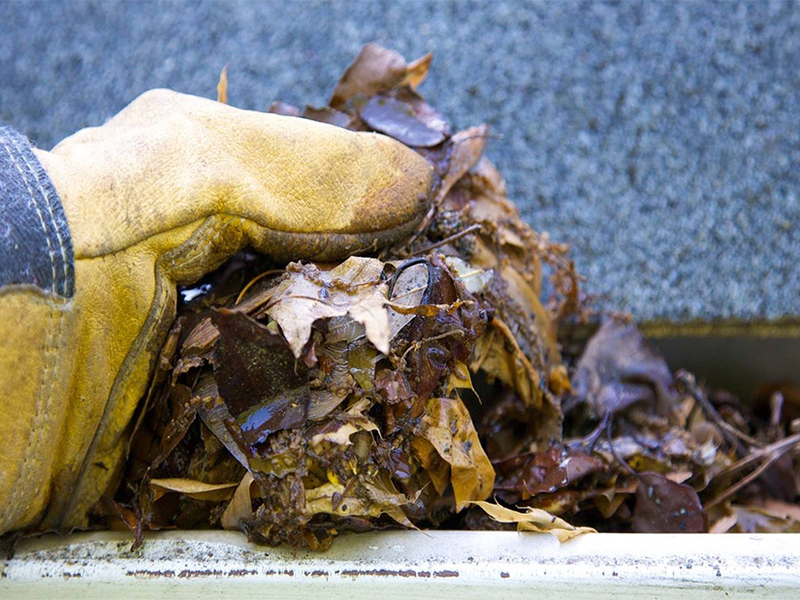 In order to clean your gutters safely, protecting your hands, eyes, and wearing the proper shoes is important. Wear gloves and proper eyewear. Gloves will guard you against decomposing leaves that can contain bird and squirrel droppings which are full of bacteria. Wear rubber sole shoes. They tend to adhere best to wet surfaces and can help prevent dangerous slips or falls when having to climb on the roof. Choosing the right tools for the job vary home to home, but we will give you a ballpark of where to start. A step ladder is great for single story homes where extension ladders are ideal for two-story homes or taller. Gutter cleaning scoop (preferably plastic to eliminate damaging or scratching the gutter) if you don’t want to use your hands. 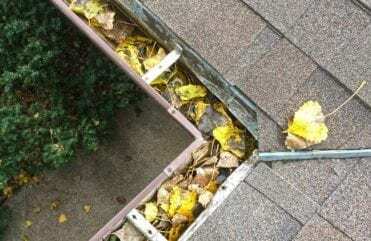 If your ladder has a small shelf you can set the bucket on that to collect the leaves and debris from the gutter. Start at the top and work your way down. Cut back branches or foliage that hang over your roof and remove all debris. 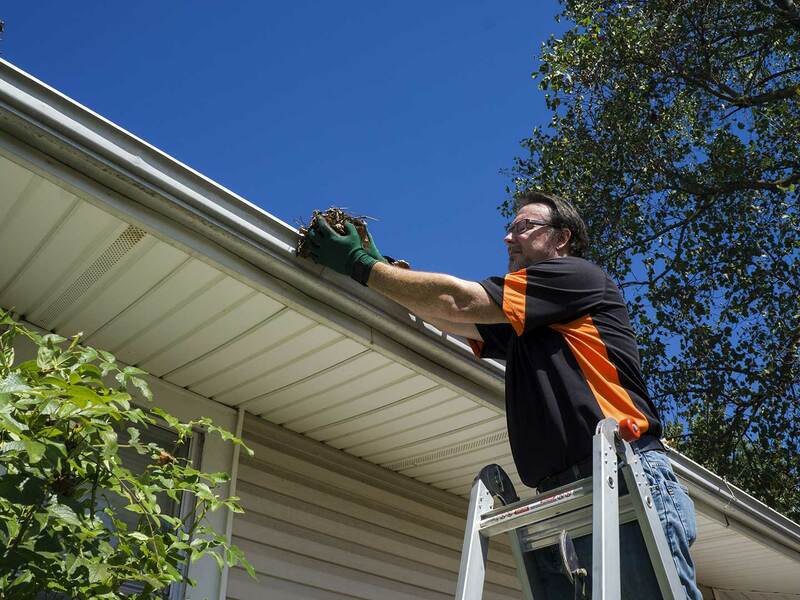 Clear the corners and downspouts of your gutters first. Toss debris in a bucket to avoid throwing on the ground where it can become a slipping hazard. After you think all of the debris has been removed and the gutters are clear test them out. Run the water hose to check that the gutter system is draining properly. Check for leaks and clogs. If you run into a clog in the downspout, try and flush it out from the bottom, if that doesn’t work, you may have to remove the downspout all together. Schedule semiannual cleanings. 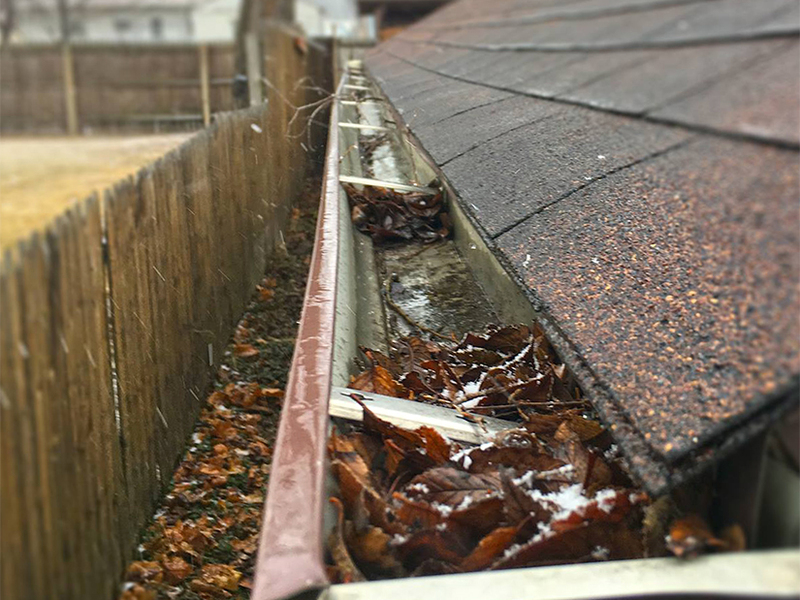 Stay ahead of water damage caused by clogged gutters with routine maintenance. But doing so you can extend the life of your gutters as well! By installing LeafGuard® Brand Gutters, you can eliminate gutter cleaning forever. Talk about the best way to clean out gutters by never cleaning them again! Time is money, consider the average cost of gutter cleaning and the time it takes year after year; it adds up, and your time is valuable. 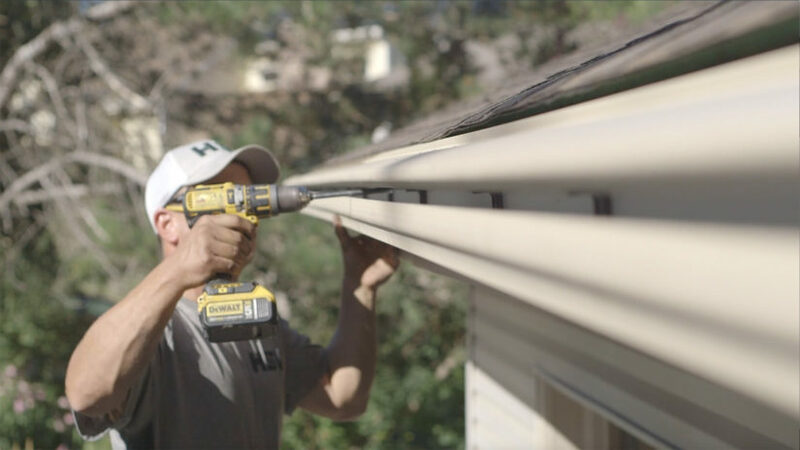 By investing in the original and only one-piece, patented, seamless covered gutter system, you can eliminate leaks and the threat of water damage caused by faulty gutters. 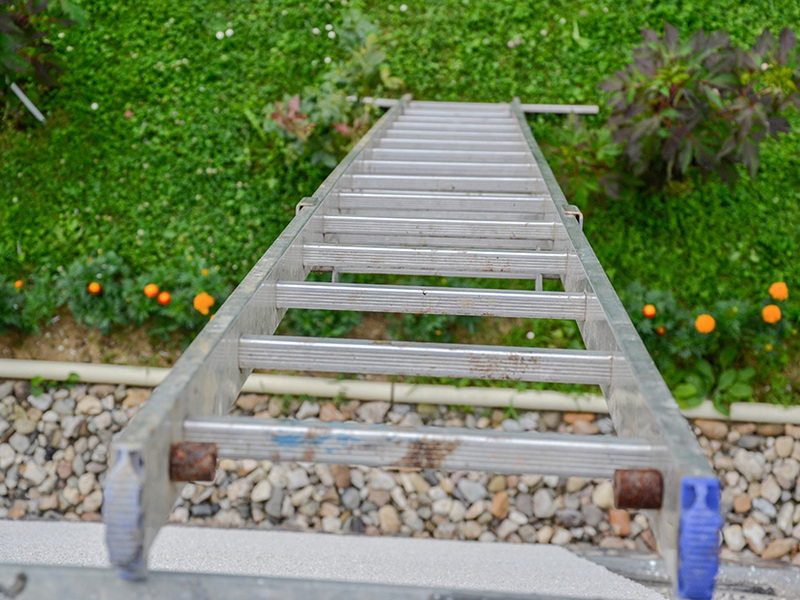 In addition, you will remove the chances of injury associated with climbing ladders to clean gutters. Just thinking of the time and effort it will take to clean gutters is exhausting. It is one of the worst home maintenance chores homeowners have to worry about. 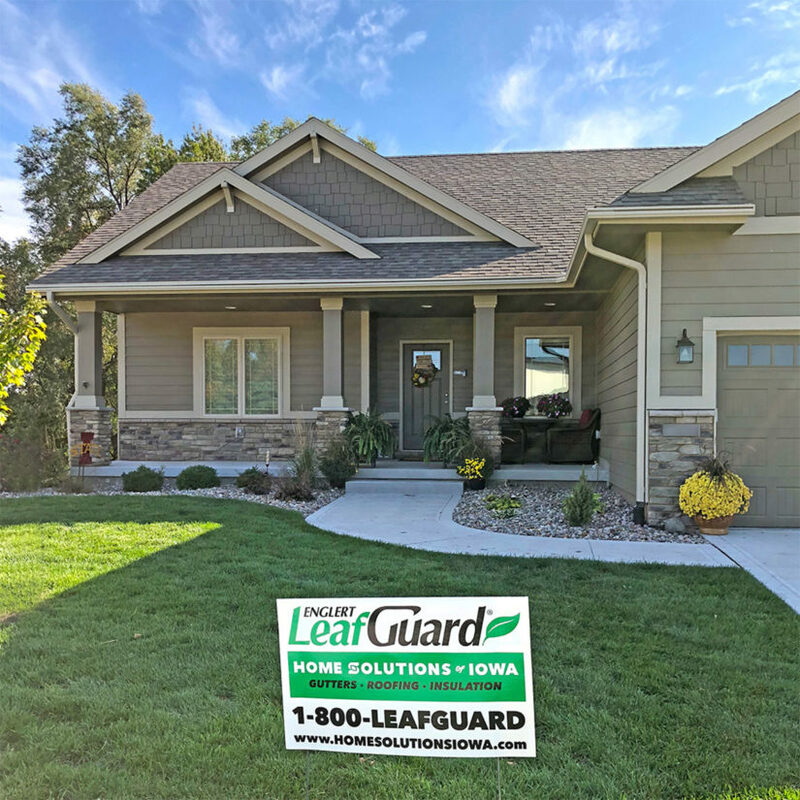 Never search “Gutter Cleaning Service Near Me” again, and contact Home Solutions of Iowa for your free LeafGuard® gutter estimate.